This CD is a compilation of NBB's first two albums, My Native Home and Idle Time. 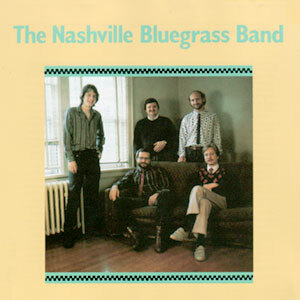 The albums were digitally mastered for Rounder Records compact disc The Nashville Bluegrass Band, which includes six analog cuts from NBB's first album, My Native Home, plus nine tunes from Idle Time. I must go down to the Station Inn, the old wooden floor, the back room and stage. And all I ask is a bluegrass band and a banjo speaking clear as a man driving nails a-way off up the holler; the smell of popcorn, the heat of the crowd, a good old country girl, and a fiddle's lonesome call to the mandolin's personal memories, and the secure sound of a tight quartet with the bass scraping the floor. I must drive out wide to East Tennessee in the sunset of an April evening with the tape player reminding me of Southern times gone by in the language of a flat top guitar; my partner's gentle footpat on the floorboards of the car. So now, tuning up in a dressing room in Johnson City to the far off whistle of The Train Carrying Jimmie Rodgers Home -- now a column of smoke on the horizon. Ladies and gentlemen, the Nashville Bluegrass Band.